The Tory Burch Foundation invited AART Executive Director, Michelle Sullivan, to attend The Embrace Ambition Summit on Tuesday, April 24th at Alice Tully Hall, Lincoln Center. Many nonprofit executives gathered with women entrepreneurs from all over the world to discuss the idea of doing well while doing good. “To say it was a transformative experience would be an understatement! It was a global think tank for a day of the most innovative minds to discuss the way we think about the entrepreneurial business community’s relationship with nonprofits” Sullivan pronounced. Among the speakers were Virginia Delegate Danica Roem, Congressman Joe Kennedy III, and House Majority Leader Kevin McCarthy. Other power players included author Margaret Atwood, actress Julianna Margulies, journalist Katie Couric, and Olympians Linsey Vonn and Ibtihaj Muhammad. 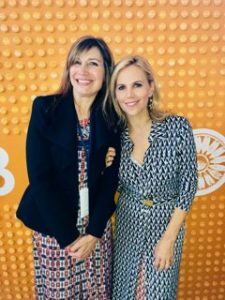 Tory Burch took the opportunity to chat with as many of the attendees as possible and took an interest in the nonprofits and their myriad contributions to the communities they serve. Laurie Fabiano, president of the Tory Burch Foundation, told Michelle the intent of the Summit was to begin conversations and make connections across the entrepreneurial community as well as the nonprofit sector with the hope that the conversations would continue long after the Summit ended. Actress Zoey Deutch told the audience that she can feel overwhelmed with what is going on in the world. She said it almost stymies her and sometimes she doesn’t know how to contribute to society. Deutch recounted Gloria Steinem’s powerful statement, “You can do anything, but you can’t do everything.” The nonprofit community knows this all too well!